Sorry I have that song stuck in my head. I just came in from sneaking around watering my garden. Why? you may ask.. Well, it’s not because we have restrictions on, in fact I live near the Mississippi and after the record amount of snow melt and rain this year, my well is overflowing. No, like the coward that I am, I was sneaking around avoiding my neighbor. He’s a nice elderly man who claims that I gave his yard Creeping Charlie. I don’t have any in my yard but nevertheless he says it is so. He also has a thing about people watering. I have an overflowing well and rain barrels but he’s not the logical sort. 99% of the time I find him amusing, the other 1%, well let’s just say it’s a good thing my mother made me learn my manners or I would be asking people to raise bail money for me. It’s been a muggy hot summer so far. I haven’t done much painting wise, though in my head I’ve created masterpieces! 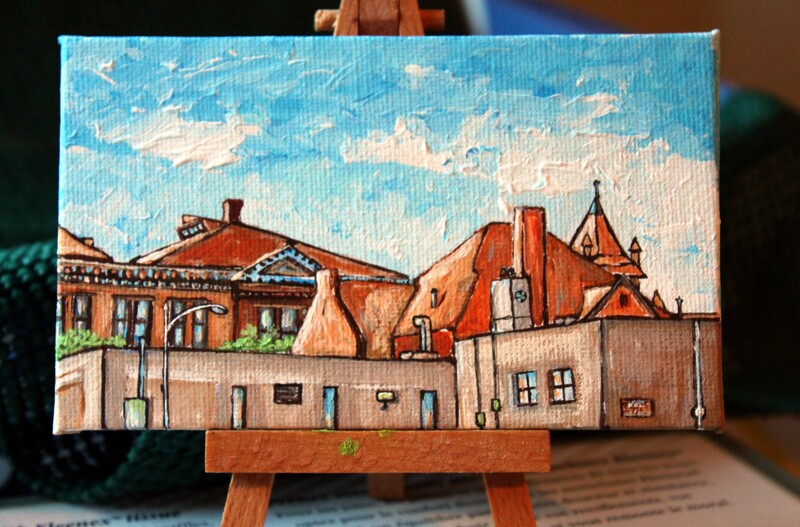 This is a small 3×5 canvas of the backside and roofs of Rock Island , Illinois. It’s acrylic. 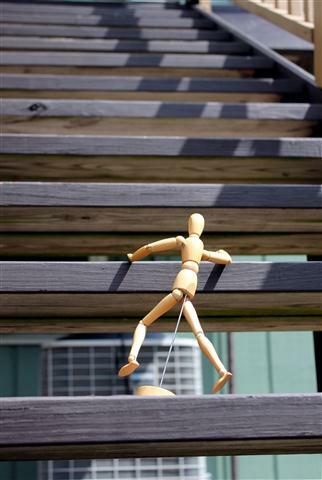 Well I should go find Dummy, he’s off gallivanting around. I think he may be trying to escape. < Previous Can’t see the forest for the trees..
Next > Gardening and car crashes..
Ha! You post the neighborly post the morning after my neighbors’ children climbed in the family car, parked on their inclined driveway, released the parking brake and the thing rolled down the drive and smacked into the only shade tree I have in my front yard. I hope the three foot crack they put in the bark does not affect its’ health over time. You should see their bumper! Love the photo and the painting. LOL! That’s funny and terrible at the same time! I hope your tree is ok! Dummy is very bold, and most awfully adventerous. My Middlest has the cousin of your Dummy, I think, and his name is C3PO! He’s not as adventerous, but he sure turns up in some odd places!!! Thank you so much for visiting my place- I’m honoured you liked it, with your artist’s eye! And thank you for your lovely comments too! PS forgot to say, I love the lines which roofs make when you look at a group of buildings from the back- my room at college looked over the backs of old buildings and I never got tired of the lines and angles. Your painting reminds me of that! Thanks again. 🙂 I was going to paint the front but the back struck me as being more interesting. It reminded me too of a view from an apartment I had when I was younger. This post made me giggle. Sneaking to water and chasing after dummy! 🙂 What a life you lead, when first we seek to please. haha have a great day CCC’er! Hah! I love “The adventures of Dummy”! What an imagination…I thought for sure I’d find more verse from you in your blog…you’re so clever! Nothing like a song called Summertime by Sublime to start off anyone’s day…. amazing art…love your talent! Thank you Mr T. I hope the weather has cleared up for you down there.